Acoustical ceilings, also known as drop or suspended ceilings, have become a convenient way to conceal ducts, wires, and piping.They can be found in a large variety of materials such as gypsum, wood, metal, etc.which makes it easy to conform these ceilings into your decor. 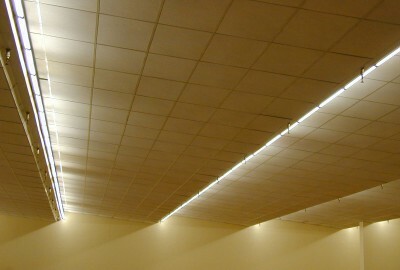 Relatively new on the market, acoustical ceilings witnessed a surge of popularity in the 60’s and 70’s. Nowadays they are primarily used in commercial spaces serving the purpose of providing a modern feel while disguising the piping and wires that you wish to hide, as well as sound insulation. Our Weekly Acoustical Ceiling Specials!